Might – your character’s physical strength and attack power. Finesse – your character’s physical precision. Quickness – your character’s speed and reaction times. Vitality – physical health and force of personality. Wits – intelligence and arcane potential. Resolve – ability to endure physical and mental challenges. Attributes also determine the base values of skills. Each skill has a primary and a secondary attribute that contribute towards the skill’s rank. Primary attributes increase the skill by 1.5x the Attribute value, while secondary attributes increase the skill by 0.5x. 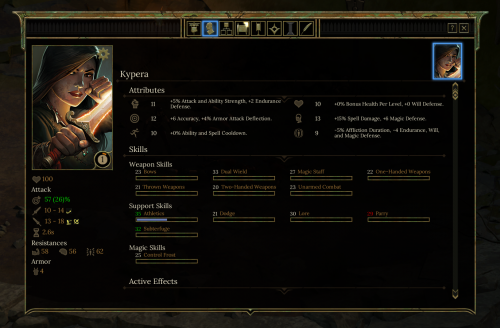 The One-Handed Weapons skill, for example, uses Might as its primary and Finesse as its secondary. A character with 15 Might and 10 Finesse would have a base One-Handed Weapons skill of 28 ( 15 Might * 1.5 + 10 Finesse * 0.5 ). Attributes also contribute towards secondary statistics, such as the Endurance, Will, and Arcane resistances. I wanted skills to increase as you use them, rather than spending skill points at level up. This meant a fundamental change to how character progression worked. In Eternity, characters gain experience as they complete quests and objectives. Individual combat encounters or conversations had no effect on level, unless they advanced a quest. With the decision to increase skills by use, I needed skill gains to contribute towards character level. Otherwise you could theoretically have a character with a hundred ranks in a skill, but still technically considered ‘level 1’. So, in Tyranny as you use skills they gain experience. When they gain enough experience, they increase their skill rank. When a skill increases in rank, your character gains experience towards their next level. A benefit of this is that it makes even optional combat encounters rewarding for the player. This change could have made conversations less rewarding, as players would need to fight in order to level up their characters. To resolve this, we added functionality to allow players to level up their skills in conversations. 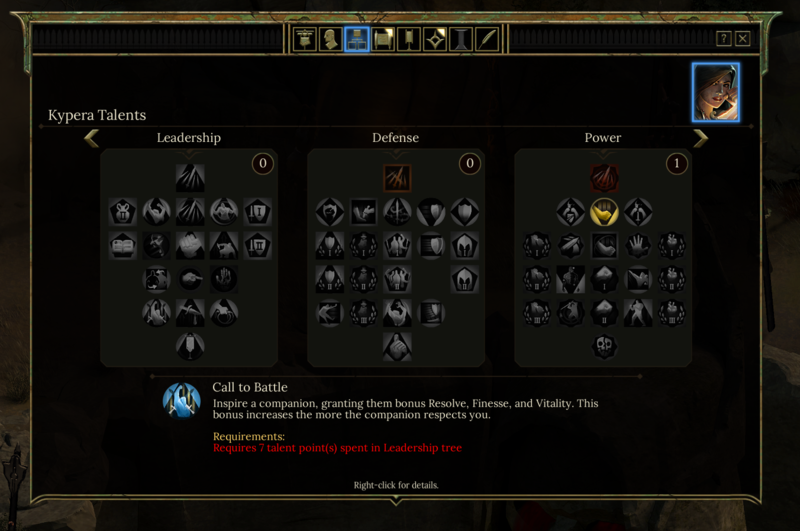 Player choices that are gated by skill requirements will add experience to those skills when they are used. Additionally, if you use a skill to intimidate an encounter into fleeing, we grant skill experience to the party equivalent to what you would gain if you fought them. It can’t be exact, as there are too many decisions that players can make during combat to replicate it exactly. So, your characters gain experience as their skills increase in rank – whether it’s through combat, conversations, or interacting with objects in the world. You also gain some experience for completing quests and objectives, though it’s a smaller portion of your overall experience than it was in Eternity. As your party members increase in level, they can improve their Attribute scores and purchase new Talents from Talent Trees. Your character has 6 distinct trees to purchase talents from, while your companions have their own unique trees. 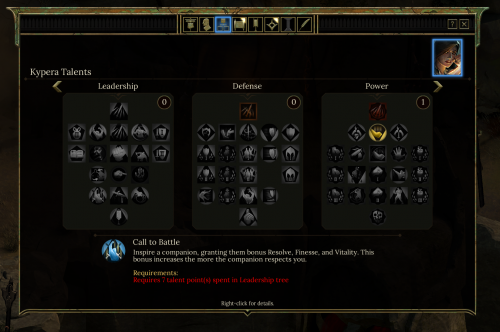 I'd call it a fairly typical "newschool" Elder Scrolls-like system, although the description of the Vitality attribute might raise a few eyebrows. What's missing is a list of all of the game's skills - it doesn't look like the character in the screenshot has access to all of them.